Thailand is the most-visited country in southeast Asia, and Chiang Mai ranks among the most popular destinations in Thailand. Locals love it as much as foreign tourists, digital nomads, and retirees. For one thing, it sits in northern Thailand's highlands, so it’s always cooler than the rest of the country. For another, it is far smaller than Bangkok (about 200,000 residents, vs. 9 million), and who doesn’t appreciate an occasional break from the big city? However, this noticeably greener city is by no means boring. There are so many fun things to do around Chiang Mai, you might have a hard time deciding what to see first. We hope this travel guide to Chiang Mai will convince you to add northern Thailand to your itinerary. You'll see that Chiang Mai is nothing like Bangkok. We’ve lost count of how many websites say Chiang Mai is the second-largest city in Thailand. Just so you know, it’s not. Chiang Mai has just over 200,000 residents, making it the seventh-largest. Why is this important? Because online information can be inaccurate or out-of-date. Please be sure to verify key details before you go, particularly locations, visiting hours, and admission fees. The Lan Na or Lanna Kingdom, existed in present-day Northern Thailand from the 13th to 18th centuries. Its first capital was Chiang Rai, but Burmese invaders plagued it for decades. Finally, the king decided to move the capital city further away from the border. King Menrai declared his capital would be further south, founding Chiang Mai, which means New City. This time, he wisely surrounded his new capital with a city wall and moat. Chiang Mai's walls remained intact until the Second World War and the only way in or out of the city was via one of its six gates. Each gate had guards who would remove the bamboo bridges spanning the moat and lock the gates. They didn't protect Chiang Mai during the Japanese occupation, though. They used its bricks to build a road up to Pai. Today, the kingdom of Lan Na lives on in the region's name – Lanna. Now, modern buildings surround Chiang Mai Old City, and its walls and gates were rebuilt in the late 1960's. And along with what to see in Chiang Mai, we're also going to share the essential planning tips at the end as usual, like how to get around and where to stay. Let's start with what Chiang Mai is known for: Buddhist temples or, as the Thai call them, wats. Northern Thai temples and architecture are a fusion of Lanna, Mon, and Burmese styles, and thus they look quite different from those in Bangkok or Phuket. 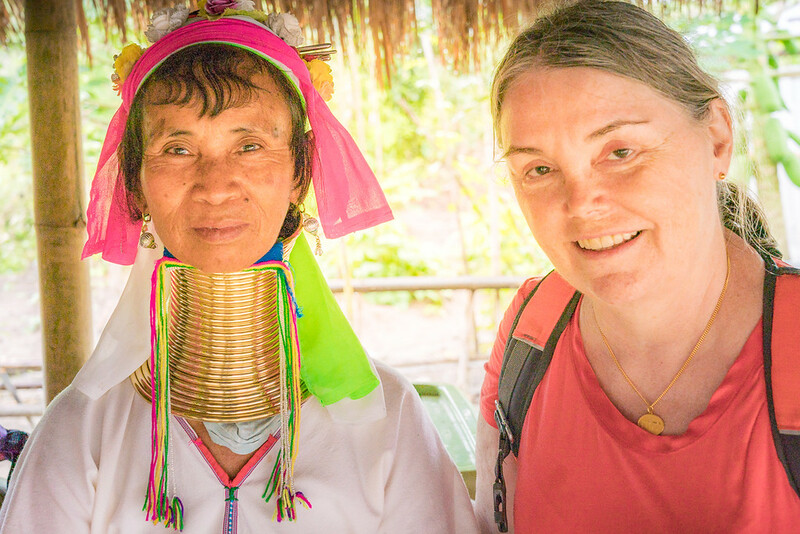 Nevertheless, no matter where you go in Thailand, wats are a central focus of Thai culture and connect the people to the traditions passed down by their ancestors. If you enjoy visiting religious sites, you'll be happy to know that Chiang Mai and the surrounding area is full of them, several hundred in fact. It may seem senseless until you understand the culture. At one time, kings erected wats not only to show their devotion, but as a way to display their wealth and power. These wats could also be used as hospitals and schools as well as centers of worship. Smart. These days, temple hopping is one of the most popular things to do in Chiang Mai, and a lot of tourists like to spend a day or two travelling from one temple to another. We don’t know if anyone has counted how many wats are actually in Chiang Mai Old City proper, but there are dozens, for sure. No matter where you turn, you'll probably see another temple you could add to your itinerary. Don't be surprised if all those wats start to look the same after a while. Savvy travelers choose to see only a few to avoid this “temple burnout.” We suggest you focus on the most notable wats, like Wat Phra That Doi Suthep, Wat Chedi Luang, and Wat Phra Singh. Read on for those details. Chiang Mai is a rich and vibrant city filled with friendly people who will do their best to make tourists at ease, and do it with a smile. It is with this in mind that tourists must remember to be the best guests they can be. That is, be as culturally sensitive as they can and respect the city and its people. Being a respectful and open-minded traveler will always result in the best possible travel experience. Obey the posted rules with regards to cameras and talking. Take your shoes off before entering shrines. When around a monk, keep your head below his. Buddhists do not like to be touched on the head or the shoulders because the head is revered in Buddhist culture. Be kind and patient with people who are attempting to speak English. After all, they probably speak more English than you do Thai! Doi Suthep is Chiang Mai's golden temple. It crowns the top of a mountain road in the Doi Suthep-Pui National Park, about 15 km outside of Chiang Mai. The grounds offer golden monuments, stupas, pagodas and statues of both Hindu and Buddhist deities. The 600-year-old temple is surrounded by gorgeous forests and views of the city below. To get to the temple, we took a songthaew from the Old City to Chiang Mai Zoo (cost: 50 baht per person), then transferred to a second one that took us up the mountain (another 40 baht each). At the top of the hill, the road is lined with souvenir shops and stalls, so you can stop for a quick bite. Fortunately, for those who don't want to accept the challenge of climbing the 306 steps, there's a funicular that goes to the top. We thought it was well worth paying 20 baht each for tickets. Once at the top, you'll see that Doi Suthep is no peaceful meditation retreat. Far from it; you will join the swarm of tourists on a terrace with several shrines, statues, and heavy bronze bells for the prayers. The terrace also offers a double balcony with a panoramic view of the city and airport. Ramps and steps lead up a higher, walled area that is the center of worship. This higher terrace contains a massive collection of golden statues, candelabra, shrines, and niches, but the focus of worship is a towering golden stupa, where a steady stream of worshipers circle its base. Many also come here to receive blessings from a monk. In Thai culture, it's a sign of respect to keep your head lower than his. Thus, if you enter a room to receive a blessing or take photos of a monk, you should sit on the floor. Culture insight: Walking around a stupa (which contains holy relics) for is a gesture of respect. It must be done clockwise so it is always on the right-hand side. The idea is to walk around it three time or more, meditating on the Buddha's teachings with strong devotion and with an undistracted mind. Built in 1385, Wat Phra That Chedi Luang really lives up to its name: luang is the old Lanna word for “very big.” The wat's main chedi (stupa) measures 88 meters in height and 24 meters in diameter, making it the highest point in the Old City. Each side of the building has cracks so it is very much a crumbling ruin, but on the plus side, this testifies to the long and elaborate history of Chiang Mai. Each crater in the wall has a story behind it. Some pits are a result of earthquakes. Others are due to cannon fire from the Burmese (in 1775) and other conflicts around the city. Even though it is not as ornate or beautiful as some of the others, it is easy to walk to this wat from almost anywhere in Chiang Mai. If you prefer bright colors and dazzling architecture, make a note to visit Wat Phra Singh, one of the finest examples of classic Lanna-style temple architecture in Northern Thailand. This temple boasts both granite floors and walls decorated with delicately hand-carved and embossed designs, all contained within neatly manicured gardens. Wat Phra Singh dates from 1345 and is dedicated to the Phra Singh, or Lion Buddha. (Singh is the Thai word for lion.) The temple got its name from an impressive statue of the Lion Buddha that was brought from Sri Lanka in 1367. Another building in the complex holds a copy of the famous Emerald Buddha. The original statue was moved to the Grand Palace in Bangkok. Tip: This temple is particularly breathtaking at sunset. If you get there at about 4 pm and leave at closing time, you can catch a glimpse of the sunset behind the golden buildings. If architecture and temple signposts are not enough to satisfy your cultural curiosity, many temples offer monk chats. This involves sitting at a table and sharing an informal conversation with one or more monks (usually novices). These chats are held to help improve the students’ English. The monks will have a list of questions they can ask, but visitors are also allowed to ask them anything. One could ask them why they went into Monk schooling or where they come from or even if they will remain a monk after their schooling is done. Some boys will open up straight away whilst others take some time to warm up and find their confidence. You can find chats at Wat Chedi Luang. Wat Phra That Doi Suthep and the Buddhist University. The chats normally run from 9am to 6pm on Saturdays and Sundays and visitors can stay for as little or as long as they wish. Chiang Mai is well-known for its shopping options, and you can find everything from local markets to boutiques and modern Western malls like Maya and Central Festival. Most visitors want to experience the local scene – even though it's super-crowded with foreign tourists – so here are some of the best local markets in Chiang Mai. Warorot Market, or Khad Luang, is quite possibly the most popular of the night markets with both tourists and locals. The market is located in a building on Chang Khlan Road, with a few levels that are dedicated to different things. This is a must-see for food lovers as there is a wide variety of local snacks and specialty dishes. The stalls lining the outside of the building are brimming with fresh fruits and vegetables. If you're looking for local trinkets and doo-dads, schedule an evening for the Chiang Mai Night Bazaar on Chang Moi. This colorful night market is covered by a large canopy to allow shoppers endless hours of rain-free retail. Filled with brightly decorated items, this market is ideal for those who want to pick up something for friends back home. Also known as “Wualai”, the Saturday Walking Street Market is packed full of tourist souvenirs but also offers some more unique wares. Shoppers can buy clothes, bags and artwork from up-and-coming local designers. Buskers fill the street with live music, vying with tempting trails of steam and heavenly smells from countless food stalls everywhere you turn. Sometimes called Sunday Market, the Sunday Walking Street is the best way to end a weekend of site-seeing and exploring. Beginning around 4 pm every Sunday, Ratchadamnoen Road closes to traffic and the store owners lift the waterproof covers from their stalls and open for business. With stalls hawking art, crafts, food, music and more, there's probably something for everyone. This market is ideal for people wanting to pick up some authentic handcrafted items and grab an inexpensive plate of delicious food, or try something really unusual. If you're wandering down the south side of the Old City, explore the Chiang Mai Gate Market. This market takes on the role of a farmers’ market during the day, flaunting some of Thailand’s best fresh and dried produce. By night, it transforms into an open-air food truck dinner spot. Loved by locals and expats, this is a perfect place to pick up a quick, cheap meal, day or night. Northern Thai cuisine is nothing like the sweet, coconut milk-based foods you might be used to. Coconut doesn’t grow in the area, so most soups and curries are clear and broth-based. They also eat a lot of chicken and pork; seafood is rare this far from the sea. Even the rice is different. Tthis area prefers sticky rice to the jasmine rice served in the rest of the country. Both Chinese immigrants and Lao and Burmese invaders have left their influence on the local food. So has the climate; a lot ofcool-weather vegetables and herbs grow in the area. The result is rich and flavorsome dishes that are not to be missed, and our favorite is khao soi. Khao Soi is Chiang Mai’s go-to noodle soup. Egg noodles in a light chicken broth-and-coconut milk curry and topped with a lime wedge for tang and a pile of crunchy, fried noodles for crunch. It comes accompanied with a small condiment dish filled with sliced shallots, mustard greens, and dark red chili paste. Go easy on the chili paste; it has a powerful kick! By the way, for a more contemporary food experience, you can explore the city streets and discover the upcoming hipster food scene. There is a wealth of tea shops, artisanal bakeries, coffee shops with latte art, and even rooftop bars – and as a bonus, it's easy to find places that offer free wi-fi. You can even enjoy coffee with a bit of animal love at one of the city's cat cafes. If you're not a fan of felines, there are now a few dog cafes as well. If you’re a hands-on tourist, you may enjoy taking some classes. Chiang Mai boasts many places to learn Thai cooking, language, massage techniques, and more. Thai cooking schools have to be some of the most fun things to do in Chiang Mai. Most start with a morning tour through a local market, where the instructor will explain the typical Thai flavors and ingredients. The class then moves to the classroom, where you learn how to combine the four Thai flavors (salty, spicy, sweet and sour) to create some of the region’s most-loved dishes. Some schools even offer classes specifically for vegan or vegetarian cuisine. These courses are available throughout the week. Gathering a few new recipes for some of the dishes you enjoyed is a wonderful souvenir from your trip – and as a bonus, it never collects dust! For us, cooking for our friends is a fun way to share our trip when we get home. Thai massage is a blend of stretching, muscle compression, and rocking that increases flexibility and relieves tension. Chiang Mai is full of spas that offer it at far less than you might spend elsewhere. Tip: One of most unique things to do in Chiang mai is to get a massage from a prisoner at Chiang Mai's women's prison. They have a program that trains inmates to become Thai masseuses so they have a reputable source of income once they have served their time. Here are a few ideas for outdoor activities you might enjoy, as well as some animal encounters for those of you who wish to see beasts up close and personal. Many treks are simple enough for travelers to take on alone while others will require a guided tour. Simple treks include the trail from Wat Pha Lat to Wat Doi Suthep. This is an easy- to medium-level trail and ends up at the gorgeous temple in the National Park. Another is the trail around the Huay Tung Tao Lake, which is also home to a small fishing village. The village offers food stalls to explore and picturesque fishing huts. Many guided treks can be booked as a package and can include treks up to remote mountain villages. Visitors can stay an evening or two and experience cultural rituals, dances and day-to-day routines. We’re talking about mountains after all, so it stands to reason that Chiang Mai province has more than a few waterfalls that are worth a visit. On a hot and humid day the water is cool and refreshing. One of the most unique is Bua Tong or the Sticky Waterfalls, a beautiful, multi-tiered waterfall about 90 minutes out of town. Lmestone and mineral deposits create enough friction that you can easily climb up the waterfall (with the help of ropes). Most people walk to the bottom and then climb up the waterfall to the top. Mai Se is popular and only about a 30-minute drive out of Chiang Mai but be ready for a short walk up to the waterfall from the entrance. This impressive waterfall has eight levels, many with pools to swim in. The lower levels are often the busiest. For a little more privacy, walk up to the higher levels. Watching an elephant perform tricks or taking an elephant ride may seem like fun, but you need to know that many elephants are abused by their owners. Sometimes, these can be just as cruel as the practice of logging or circus training, so be aware as you choose where to spend your money. The elephants at these parks have been rescued from their tourist-riding, circus and logging pasts and are allowed to live as family units in a natural environment. No one is allowed to ride elephants, but visitors can feed, bathe and play with these elephants. Elephant Nature Park also offers overnight visits and volunteer opportunities. For an added level of flora and fauna, there's also the Bai Orchid and Butterfly Farm. Filled to the brim with weird and wonderful orchids all growing on wires and lines, visitors can learn a lot about the history of orchids and why the Thai revere them so much. The butterfly area is gorgeous and especially good for families. Butterflies surround the people in the area and will even occasionally land on a hand or head! It is important to remember, though, not to touch them or their wings as this can cause irreparable harm. Thailand’s first ever treetop zipline course, Flight of the Gibbon features some of the longest and highest ziplines in Asia. Their name was inspired by the wild gibbons living in the area, and you may see them swinging through the forest canopy during your adventure. To have the best chance to see these majestic endangered animals, plan for a 6.30am pickup. The gibbons are most active and vocal in the mornings. The zipline course has no age restrictions, but you must weigh under 125 kg/275 lbs and be at least 1 meter tall to fit into the safety harness correctly. Chiang Mai’s other major animal attraction is Tiger Kingdom, and it’s a controversial one. Here, you not only get to see a powerful, dangerous, endangered animal up close, you can pet them, hug them, and even pose for photos with them. Because tigers are endangered – only a few thousand exist in the wild – some people hold that Tiger Kingdom’s breeding program is important and that it provides protection from poachers. For animals that are unable to fend for themselves in the wild, tourist fees offset the cost of food and maintenance. Others argue that wild animals should not be used to attract tourists under any circumstances. Not fully set on where we stand on the whole issue, we did visit Tiger Kingdom. We paid to enter the large and small tiger enclosures, each of which had 2-3 tigers, and we were encouraged to pose with them all. We brought cameras in with us – you can take as many photos as you wish at no charge. If you prefer, a professional photographer is available (300 baht for a CD of 50-100 pictures). Note that visitors must be a certain size to enter the enclosures. Once you get there, pay attention, listen and obey the rules that the keepers set out. No one wants to be at the business end of a tiger. With regards to animal tourism, everybody has their own opinion. We report, you decide. If you do plan to put it on your itinerary, please be sure to research the park before you go. At the very least, make sure that the animals are well-looked after and are not drugged or chained at any point. As to Tiger Kingdom, we’ll admit that we went with some misgivings after another hotel guest (who hadn’t been there) told us that the animals are mistreated, drugged and declawed to keep them in line. We kept that in mind while there and watched for telltale signs. Honestly, we didn’t see anything like that, and judging from how the staff were dealing with the tigers, well, let’s just say they were super-watchful. The tigers were alert and the youngsters were playful … and by the way, they still have their claws. This just goes to show that no matter where you hear it, you shouldn’t believe everything people say out-of-hand. If you’d like to learn more, here’s the link to their page on tiger health. Thailand is governed by three seasons: wet, dry, and hot. It's also called the rainy season (roughly June–Oct), cool season (Nov–Feb), and hot season (March–May). June to October is Chiang Mai’s wettest and most humid season, so the city is much quieter at this time. The skies will often be overcast and it will rain most days, but often only for a few hours in the afternoon or at night. Blame the southwest monsoon for all the wet weather. It comes from moisture gathered from the Andaman Sea and the Gulf of Thailand. We visited northern Thailand in early August and came equipped with umbrellas and waterproof footwear. Aside from not as much sun in our photographs, the occasional rains weren’t much of a problem. The most popular tourist season to visit Chiang Mai is definitely November to February, when the temperature hovers around 25°C (77ºF) and there is hardly any rain. Tourists are advised to pack a jumper and a waterproof jacket just in case. This period is ideal for outdoor activities, plus, there are some great festivals held during this time as well. February – take in the sights and smells of the Chiang Mai Flower Festival. Things start heating up between March and May. Temperatures peak at 40°C/ (104ºF), which can make spending time outdoors quite uncomfortable during the mid-day. Tropical sun, heat and high humidity can take a lot out of a traveler, so go slow and plan your activities around an afternoon nap. One popular activity occurs in April – the Songkran festival, a.k.Thai New Year. Songkran is loved for its massive “water fights,” where any passerby may be squirted with a water gun or just have an entire bowl or bucket of water dumped on them. If you're there for the festival, you must dive right in and join in on the fun. A good drenching can be a welcome relief from the intense heat. Tip: Hot season is perfect for folks who prefer to spend their holidays lounging around the pool and sipping cocktails, because sizzling temperatures mean lower hotel prices and amazing flight deals. As with most places in Thailand, getting around Chiang Mai is easy and relatively inexpensive. Songthaews are by far the cheapest and most popular way to get around. These cleverly converted red pickup trucks are more comfortable than a tuk tuk and will get you just about anywhere in the area. As an added bonus, songthaews are a Thai icon, offering a more authentic local experience as well as great Instagram photos! The daytime rate is generally around 30 baht. Everyone knows about Thailand’s tuk-tuk – they are quick, noisy, they go everywhere, and depending on your bargaining skill, they are inexpensive. Tuk-tuk is, after songthaew, the second most common mode of transport in Chiang Mai. Compare to songthaew, tuk-tuk is more expensive. Rate starts at 60 baht for a short trip and 100 to 150 baht for longer distance. For an air-conditioned ride, take a metered taxi. These taxis are hard to find on the city streets and generally hang around the bus station, airport and malls. Most hotels will be able to book these taxis for you whether it be for an airport transfer or to travel to an attraction. While the air conditioned ride is a definite plus, there's also a downside. Prices are significantly more than the Songthaews, with rides costing about 100 – 200 Baht within the city. If you have data access or a portable Wi-Fi device, you can catch a ride using Grab, a well-known app in Southeast Asia. Grab is Southeast Asia’s version of Uber and is just as popular. Grab offers air-conditioned cars, door-to-door service, and affordable prices. You can choose to ride in a private car (GrabCar), a regular taxi cab (GrabTaxi), or even a Songthaew (Grab RodDaeng). As an added benefit, users collect points with every ride, and can redeem points for free rides, food, and other benefits. Tip: Download the app using our referral code GRAB408463GB and get 500 points toward a free ride. For more energetic travelers, bicycles and scooters can be rented easily in Chiang Mai, even without a valid license and without a helmet. Be aware that you can be fined for these offences, however. Bicycles are obtainable for around 50 Baht a day and scooters for about 99 Baht a day with a deposit of roughly 2000 Bhat. As you might expect, this tourist city has a large selection of lodging options. To get the most of what Chiang Mai has to offer, we stayed at two hotels, beginning with a 3-star place in the old city and ending with a couple of nights at an absolutely beautiful resort outside the city walls. Inside the city walls: we stayed at Rendezvous Classic House near the southwest gate. The hotel was fine, but we weren’t crazy about the location. Even though it's close to Saturday Walking Street, we had a hard time finding places to eat near the hotel, other than the markets. If you prefer a quiet hotel but want to stay in the old city, this may work for you. If not, you can find other options here. Tip: Inside the walls, stay on or near Rachadamnoen Rd. or Prapokkloa Rd. They have a great selection of restaurants. We had better luck the last two nights of our stay, after we moved outside the city walls and closer to shopping and restaurants at Khum Phaya Resort and Spa. (Disclosure: Centara Hotels & Resorts hosted our hotel stay in exchange for photos.) We had a poolside balcony room with direct access into the pool, a beautiful large room, and the bed was super comfy. After a long day trip, it was wonderful to fall into the pool and swim up to the pool bar for a relaxing, refreshing drink. Tip: One plus about the Khum Phaya location was that Grab cars arrived within only a couple of minutes and we didn't have to deal with the heavy traffic around the old city. That saved a lot of time getting to out-of-town attractions. Book a room here. Thailand's official tourist information site: Tourism Thailand. Find more things to do on What's Up Chiang Mai. Lodging: Check ratings and reviews for everything from budget hostels to 5-star resorts at HotelsCombined or Booking. Private tours: Want a unique experience? We have had good experiences with Get Your Guide, a reputable source for booking a wide variety of local attractions, day tours, and activities. That's why we've chosen to affiliate ourselves with them. Find a list of Chiang Mai tours here. Want more of this destination? Loving this list. We’ve been to CM 5 times – or more I lost track – and enjoy it more each time. So glad you like the list, Ryan. Thanks for your advice on Tiger Kingdom, too. Do you have nay other CM tips you can share?